Is this information available anywhere? If it's not, should it be available or should it not? Sometimes I want to ask a question, but I am afraid that not many users are active in the moment. And by the time peak time arrives, my question will get buried and never answered. It would be even better if we could access peak times for different tags. Sometimes I want to ask a question, but I am afraid that not many users are active in the moment. That's a valid concern, but the other side of the coin is that there a not many users who are posting questions at that moment. So the users who are active have more chance to view your question. It turns out that on average, both effect cancel each other out. I demonstrated something similar a year ago on Meta Stack Overflow. 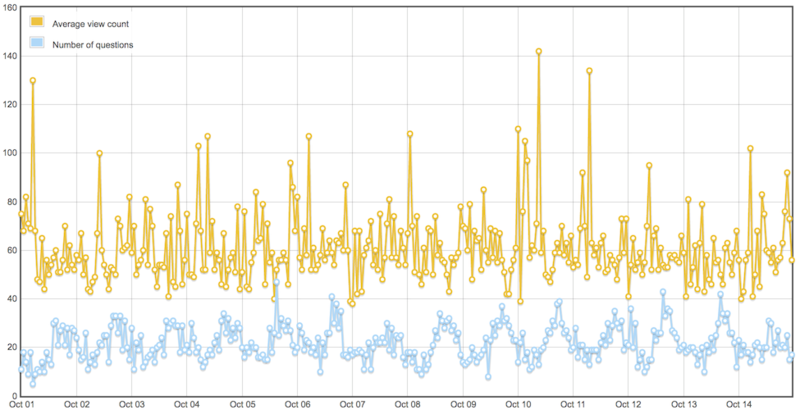 That was inspired by a slightly different question (weekday vs. weekend attention). Still, according to this query, there's no visible trend. While the number of questions (blue line) peaks every day around 16:00 UTC, the average # of views per question (orange line) behaves erratically and shows no pattern. Not the answer you're looking for? Browse other questions tagged discussion statistics . Depending on the tag is there a possibility to know on which days and hours are there more answers? Is this question appropriate--availability of (known) reference? Sticky question : I sometimes want to ask questions that I know will not be popular yet I think are good. Distribution of time to first answer in MathStackExchange? Tags for lines and planes? Is either Math.SE or StackOverflow an appropriate forum for questions about Magma? What to do with old questions whose only 'complete' answerer gives no clarification? Is it possible to temporarily disable my account on MSE? Does the reputation system encourage easy answers and low quality questions?